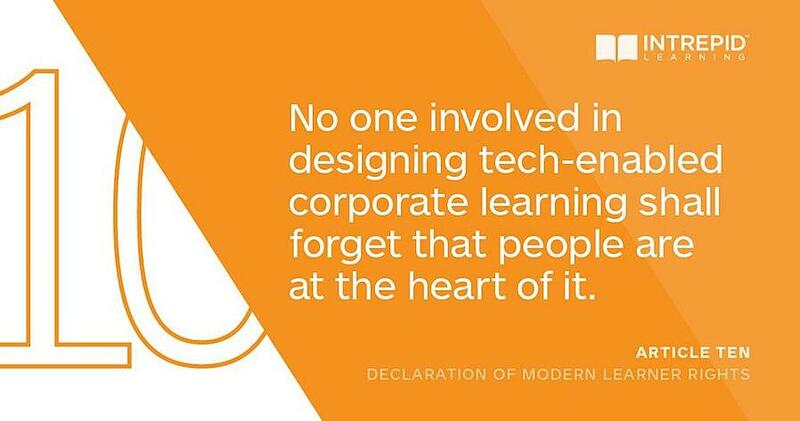 This is one of our series of posts about Intrepid's Declaration of Modern Learner Rights. How neatly Bawcombe’s thoughts intersect with mine when it comes to Article 10 of Intrepid’s Declaration of Modern Learning: “No one involved in designing tech-enabled corporate learning shall forget that people are at the heart of it.” I had a few reactions to this as Intrepid Learning’s marketing lead, both the learning part and the marketing part. There’s a lot of crossover between corporate learning and marketing. Marketing skills are required to get people to want to take voluntary courses. Making sure they know about them: that’s marketing. Keeping a learner’s interest in what’s next in the online learning experience with visuals and titles: that’s marketing. Making sure each course or online program has a personality, well that’s pretty much the same as brand voice in marketing. Or to put it another way, the marketing part is about getting learners’ attention, and the learning experience design is all about making sure you do positive things with that attention once you’ve gotten it. My colleagues will tell you that learners (and of course at some of our client organizations, that can mean over 100,000 people at once) are a diverse lot to design for even when the audience is narrowed to strictly Sales, or just newbie high-potential leaders. And the main point of corporate learning programs is to improve the corporation—through the individual. You can’t predict everything, but you can try to at least do some design team brainstorming about what different emotional states your different learners may be in when they come to your site. For instance, a learner ‘stress case’ might be “I am used to doing things a certain way but market forces are changing everything. So how do I know what I need to do?” Let’s call them Learner A. But Learner B in the same program might be saying “I know all the theory, I only need to learn this one thing. I don’t have time to go through every video.” Designing with those people in mind in addition to the perfect, chipper, has-all-the-time-in-the-world learner, makes it a better course for everyone on the spectrum. How? Take for example a performance management course that includes the topic “Feedback as a performance management tool” that covers the 5 Ws and 1 H of feedback as a topic. You and your team put together learning content in a well-structured path that explains the relationship of the previous content to the next content. This covers the “So how do I know what I need to do?” Learner A. But you can also create a space where the same content is presented as answers to questions where learners can find the same content categorized under “I have a difficult feedback conversation coming up, how do I prepare?” You might not include all the content presented in the prescribed learning path, but pull out a job aid or a how-to video to help Learner B find just what they need in that moment of need. Another idea—Learner C might be coming to a course that supports a new process that was recently rolled out in the organization. They’ve been told they have to change the way they’ve been doing things. Stress! So rather than have the course jump straight into what to do and how, perhaps include something that addresses concerns about change. Because everyone has some stress around, and resistance to, change. So, you can have a short video from a senior leader talking about the 30,000 foot business level changes requiring a new approach, or even audio of a customer talking about the impact of existing approaches on their lives and decisions. Even just that level of context is sometimes enough to overcome initial resistance and help learners keep an open mind about the content. Similarly, in regular ol’ marketing, this concept means making sure the content is interesting and on-target to the people I want to speak to. Because if it’s not, then the digital strategy technology-related numbers don’t do me much good when it comes to qualified leads and sales. And that’s why content marketers too must always remember they’re ultimately talking to people, not just to search engine algorithms. I think you can swap in both “learning” and “marketing” for “news” there. No one involved in designing tech-enabled anything should forget that people are at the heart of it. Be sure to check out all 10 Articles of the Declaration of Modern Learner Rights. 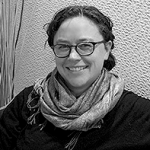 Catie Bull is Intrepid's marketing lead and has been with the company for over two years.